Whereas the area whose situation and boundaries are described in the Schedule below (here-in-after referred to as the Area) is considered to be of adequate ecological, faunal and floral significance for the purpose of protecting containing and developing Wildlife (Elephant) and its environment. And whereas the said area is comprised of Reserve Forests and after careful consideration is proposed to establish an Elephant Reserve under the Central Scheme "Project Elephant". And whereas Govt. of India vide their letter no. 7-2/00(PE)-(vi), dated 4 th October, 2001 have communicated their consent for establishment of an Elephant Reserve in the name of "Eastern Dooars Elephant Reserve" comprising the said territory. 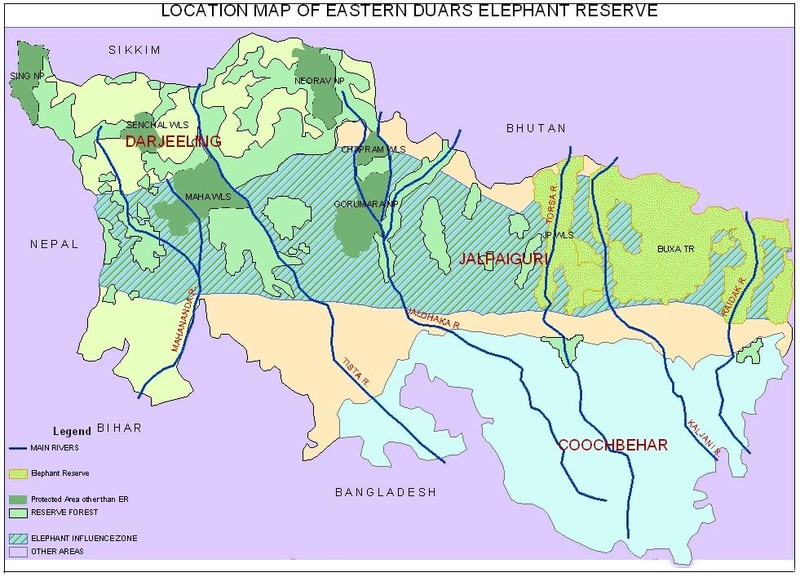 Now, therefore, the Governor is pleased to declare the area described in the schedule below as "Eastern Dooars Elephant Reserve" under the Central Scheme of "Project Elephant". Division Name : "Eastern Dooars Elephant Reserve"
Area : Core Area 484.00 Sq.Km. West : Falakata-Madarihat Road . 1. Jaldapara Wildlife Sanctuary- 115.00 Sq.Km. 2. Buxa Tiger Reserve - 369.00 Sq.Km. (a) Jaldapara - 1062.30 ha. The buffer area consists of the forest blocks of Titi, Dalsingpara, Jaigaon, Hasiwara, Nilpara, Mendabari, Bania, Godamdabri, Hamiltonganj, Nimati, Poro, Raimatang, N. Rajabhatkhawa, S. Rajabhatkhawa, Cheeko, N. Bholka, S. Bholka and part Raidak. Zone of influence with cover an area of 1800 Sq.Km. over forest area of Bamanpokhri, Khairbari, Kolabari, Bengdubi, Bagdogra and civil area of Darjeeling District Gazaldoba, Mechbasi, Kathambari, Targhera and Baikunthapur of Jalpaiguri District, Ghish, Gorubattan, Chunabhati and Mongpong of Darjeeling District, Sukna, Gulma, Sevoke and Laltong of Darjeeling District, Gorumara, Chapramari, Chalsa, Baradighi and Nagrakataof Jalpaiguri District and Banarhat, N. Moraghat, Central Moraghat, S. Moraghat, Gairkata, Lankapara, Sulkapara, Domohani and Khutimari in Jalpaiguri District. Madarihat, Nilpara, Chilapata, Jaldapara in Jalpaiguri District and Coochbehar, Mathabhanga in Coochbehar District. And civil areas including tea gardens. It is however pointed out that the intention and purpose of declaration of Elephant Reserve is for undertaking developmental activities and improved measures in the home range of migratory and resident elephant primarily within the state forests as mentioned under schedule of area and for containing the elephants within the forest area with sole idea of reducing man-elephant conflict and degradation thereof without exercising any regulatory control of the Wildlife Protection Act 1972 (as amended upto 1991) on the declared Elephant Reserve.